Helloooo to all our dear friends out there! It’s been a while since you’ve heard from the blog, but it has been one heck of a season and we’re back to tell you all about it. The 103rd summer season was a wonderful success, and our emerging artists each left with hearts full and minds ready to take on their next projects. It is especially touching to see their tributes on Facebook or Instagram when they’ve a chance to return home and catch up on a bit of sleep: to hear how their minds were changed or expanded, how they have found their voice, or how they started out with colleagues and left with lifelong friends. That, my friends, is what Seagle Music Colony is all about! ICYMI we’ve uploaded albums from each of the summer’s mainstage productions on Facebook so you can relive the summer highlights all year long. the audience reaction was enthusiastic! If you weren’t able to join us in August for the performance, not to worry. The Ghosts of Gatsby world premiere is scheduled to take place November 15-18, 2018 at Samford University. 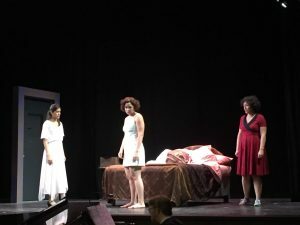 The opera was also named a finalist for the National Opera Association Dominick Argento Chamber Opera Competition; the winner will be decided at the national convention in Salt Lake City, January 6, 2019. This piece is almost certainly going places, so keep an eye (and an ear!) out. The second Fall Season workshop was the new musical Pooch, with book, music, and lyrics by Scott Eyerly. 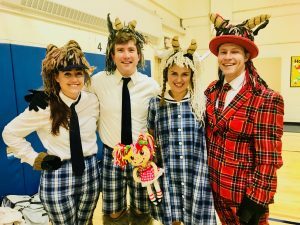 A hilarious comedy of ambition, dog-sitting, and corporate ignorance, the production was also a fun reunion of sorts for our singers, nearly all of whom are Seagle alumni from the last 5 seasons. The composer was thrilled with the talent, ability, and work ethic of all our singers. And our stalwart audience braved a particularly cold evening in the Oscar Seagle Memorial Theater to enjoy the performance, but hearts were warmed by the hilarity and romance (both musical and literal) on stage. Our production was the piece’s first ever fully-staged, fully-memorized performance, but selections of Eyerly’s work have also been seen in Great Barrington, ME; Santa Fe, NM; and in New York City as part of the New York New Works Theatre Festival. We hope to hear lots more about the successes of Pooch! Santa Fe Opera saw several of our alumni earn glowing reviews. Jack Swanson was Lindoro in Rossini’s L’Italiana in Algieri and Terrence Chin-Loy was one of the four comic players in Strauss’ Ariadne auf Naxos. Des Moines Metro Opera was another popular Seagle destination this summer. Remy Martin won hearts as Martin in Copland’s The Tender Land. He was joined in Des Moines by Catherine Goode, James Held, and Kyle White. 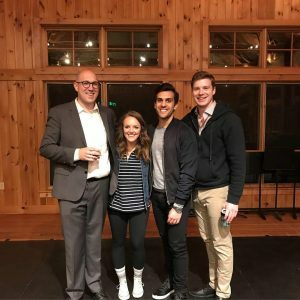 Out west in Colorado, Chris Mosz and Nathaniel Hill joined the cast at Central City Opera and lifted their voices (and their bodies – it’s some crazy elevation there!) to new heights. Also in Colorado were Zaray Rodriguez and Eric McConnell, who both graced the stages at Aspen Music Festival. The Glimmerglass Festival had its fair share of Seagle folks on display, including our 2018 Gala honoree Vanessa Becerra as Maria in West Side Story, and a small army of gents in Puts/Campbell’s Silent Night (Michael Miller appeared in the role of Lieutenant Audebert, Michael Hewitt was Lieutenant Horstmayer, and W. Clay Thompson was Father Palmer. Michael Pandolfo sang with the ensemble). Another company well-staffed with Seagle alumni was our Adirondack neighbor to the south, Opera Saratoga. This season was no exception, with singers Quinn Bernegger, Nate Mattingly, Raphaella Medina, Garrett Obrycki, & Nicholas Yaquinto as well as stage director Meghan Deiter on their roster. For a complete list (as complete as we can make it – the Seagle family is large!!) of the places where Seagle singers could be seen in the 2017-18 season in the US and around the world, check out the October edition of our contributor newsletter High Notes, located here. If you are a singer/director/alumnus/a who celebrated a company debut and we somehow missed it in our list, please email Jorie at socialmedia@seaglecolony.org – we don’t want to miss any opportunity to celebrate your successes. As for you, our lovely readers, we will update you as we hear about where our singers are headed next in 2019. In the meantime, we hope you cuddle up with some apple/pumpkin goodies and enjoy another magnificent autumn. If you (or someone you know) is interested in becoming a part of the Seagle Music Colony, we are currently accepting applications for the 2019 season. Visit us on YAPTracker for more information on audition locations and requirements. We can’t wait to meet you!